New program makes it simpler for members to realize cost savings at the doctor’s office. Members have access to new, enhanced features to shop for health care. Prices for procedures can vary by thousands of dollars even in the same town. Program reveals substantial cost savings and pays up to $500 per procedure to choose lower cost, high quality options for common medical care. DURHAM, N.C. – Blue Cross and Blue Shield of North Carolina (Blue Cross NC) has launched SmartShopper, powered by Vitals. This program is the first of its kind in the state. When purchased by their employer, SmartShopper pays members cash for shopping and comparing costs of common medical procedures. When members choose the most affordable doctors and hospitals delivering high-quality care, a check is mailed to their home. 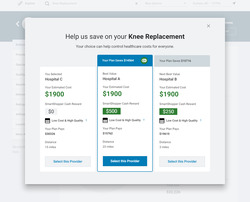 SmartShopper is the latest way the company is shining a light on health care costs and how prices vary among providers and facilities. The state is currently ranked #50 on certain cost measures. The cost of a procedure can differ by thousands of dollars even in the same town. Making it easier than ever before to compare health care costs. Paying a cash reward – up to $500 per procedure – for choosing high-quality, cost-effective locations for their procedure. Using Blue Cross NC’s large local and national network of providers. Customers’ total cost share is less with in-network providers. They are potentially able to save up to thousands of dollars in health care expenses. While all Blue Cross NC members can now use a new and improved Blue Connect to find a health care provider and cost estimates, SmartShopper is available starting with our self-insured, large group (250+) employers. Eligible members enrolled in these workplace health plans are encouraged to compare costs for medical services. They receive personalized messages based on real claims experience. If the member has their procedure done at a reward-eligible location, a check is mailed to their home once the procedure is done and the claim is paid. Customers also save potentially thousands of dollars in medical expenses. In 2011, Blue Cross NC received national attention for its health care cost transparency tool. The company was the first insurer in the nation to make public the average total cost of care for many common procedures. For consumers who want to know what they can expect to pay at the doctor’s office, the tool is a valuable starting point. With a new feature that notifies members when a nearby facility offers the same procedure at a lower cost, our website makes it easier than ever for members to compare costs.